If Brexit is going to end up feeling like a long toe-to-toe boxing match then at last we can say that the first round is over. Theresa May has come out jabbing - offering crisp points about the UK's plans to leave the single market and its readiness to walk away from a bad deal if that's all that's on offer. The European side for the moment is still acting as if what we've seen so far this week is just the posturing and chest-beating you see at the pre-fight weigh-in rather than the fight itself. Their big-hitters - politicians like the President of the European Commission Jean-Claude Juncker and his equivalent at the European Council Donald Tusk - have confined themselves to a little nifty defensive work pointing to the likely difficulty of the talks, hoping for a fair outcome and reiterating that until Britain formally triggers the departure process everything is mere shadow boxing. None of that of course will stop individual MEPs and commentators from offering their assessment of where the balance lies between the EU and the UK after Theresa May's Brexit declaration. One German colleague said to me jokingly: "I didn't realise that the EU had decided to leave the UK until I heard your prime minister's speech." And elsewhere in the corridors of the European Parliament you heard plenty of surprise at the confidence of the tone coming from London, the crispness of the decision to leave the single market and the sudden shafts of clarity after weeks in which the UK had appeared to not know what it wanted. Image caption Shafts of clarity about the UK's position in the corridors of the European Parliament? That's not to say of course that everyone has been impressed, even though Mrs May was praised in some quarters both for realism and for clarity. It's worth remembering that most mainstream politicians in Europe view Brexit as an act of madness to be spoken of with hostility and incomprehension. Britain in this analysis has taken the decision to walk away from an institution that's been an engine of peace and prosperity. Hence these remarks from the German MP Norbert Roettgen, who represents Angela Merkel's Christian Democrats. He said: "The UK's two main economic weaknesses are its considerable trade deficit and a big budget deficit. As such [UK Chancellor Philip] Hammond's threats with duties and tax cuts would primarily damage the UK and should be regarded as an expression of British cluelessness." That dismissal of an option Britain is keeping in reserve - the option of operating as a low-tax base for business if Europe refuses to cut an attractive deal - would be seen in Strasbourg as one weakness in the Theresa May strategy. From elsewhere on the German political spectrum came an alternative strand of criticism - not that the UK was trying to set up a kind of low-tax magnet for foreign investment into Europe but simply that it was cutting ties in too brutal a fashion. Ska Keller represents the German Greens in the European parliament. 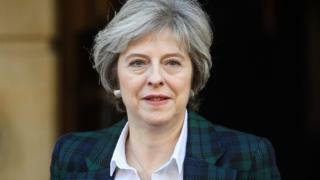 She told us: "My overall impression is that May wants to go for a super-hard Brexit. She wants to cut all ties and I don't think that's going to fly well on the rest of the continent. Theresa May didn't really make friends in the last couple of days here in the overall European Union." To the right of that broad European mainstream of course, things are seen rather differently. France's far-right National Front looks at the success of the Leave campaign in the UK with a degree of envy. It doesn't like the EU either and would like to see its core treaties renegotiated. Its senior MEP Bruno Gollnisch said: " I do think that in the end Britain could settle down to a situation rather like what it had before Brexit - after all in those days we managed things like exchanges of school pupils. And the UK will have commercial ties that reflect its specific Anglo-Saxon nature. There is no real reason why not." So there has been a sense in Strasbourg this week that a phase in a kind of phoney war has finally ended and after months of speculating about what Britain might or might not want, a degree of clarity has emerged about British ambitions towards the single market and to a lesser extent the custom unions. So far in this cautious round it was the UK which came out swinging rather than the European side. But there is a very long way to go in this negotiation and by the end of it both sides will have endured defeats and disappointments alongside their occasional moments of triumph. The UK might feel for now that its ahead on points, but everyone knows there's a long way - a very long way - to go.